19-Nov-2014 -- Whenever I'm on Queensland's Gold Coast - visiting relatives - I also think about visiting nearby Degree Confluence Points. Unfortunately, I've already visited almost all of the points that are within a day's drive round-trip from the Gold Coast. This point was one of the few remaining, and has the benefit of requiring almost no hiking, despite the long drive required to get there. From Toowoomba, I continued south-westward on the Gore Highway, through the small town of Millmerran, in the direction of Goondiwindi. About 1/2 hour after passing through Millmerran, I turned left (south-eastward) onto Cypress Avenue - a wide smooth dirt road. After about 2 km, Cypress Avenue passed just 200 metres from the confluence point, leaving an easy hike through new-growth forest. 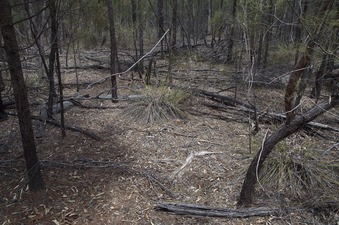 The numerous (small, stunted) pine trees growing here suggests that this land was once considered for a commercial forest. A few large, old-growth gum trees are also scattered throughout the area. Conditions were very dry; as with so many other Australian confluence points, I had the uneasy feeling that a stray spark might set off a wildfire. After my visit, I discovered an old road cut nearby. This road cut connects with Cypress Avenue at 27.99800°S 151.00038°E - 225 metres from the confluence point. For future visitors: This is the best place to start your hike.